I used one of the new backgrounds from Clear and Simple. And the sentiment is from a CSS set too, called Cupid Love. I paired these with a yummy bow and some silver pearls! I haven't tied a bow in awhile...I am sure out of practice! I used to put bows on just about every card! I hope you have a chance to play along! It's like a little 2 sketchs reunion! :) Go check out the CAS-ual blog to see our sponsor for the week and to see all the other sketch cards! Thanks so much for coming by! I just love that colour combo - can't go wrong with it! Lovely take on the sketch! Those three pearls are the perfect touch! so classy. I love it! I bought the silver gems because of you...but I have to say, mine never seem to look as good as yours! Very elegant and classy. That bow makes me swoon! Laurie, this is goegeous! Simple, classy and that satin bow is perfect! Looooove it! Love this card! The colors are yummy, and that bow is the perfect touch - tres elegant! 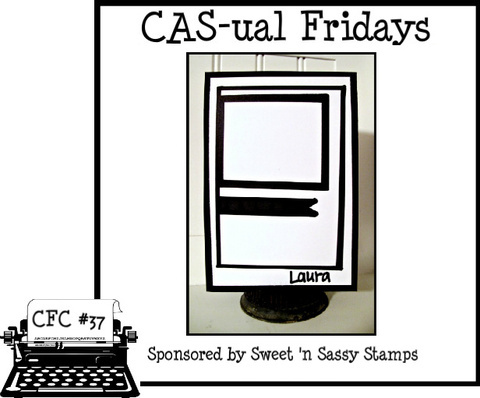 What a beautiful card, Laurie! I don't think your bow tying skills are lacking whatsoever...especially compared to mine. LOL! 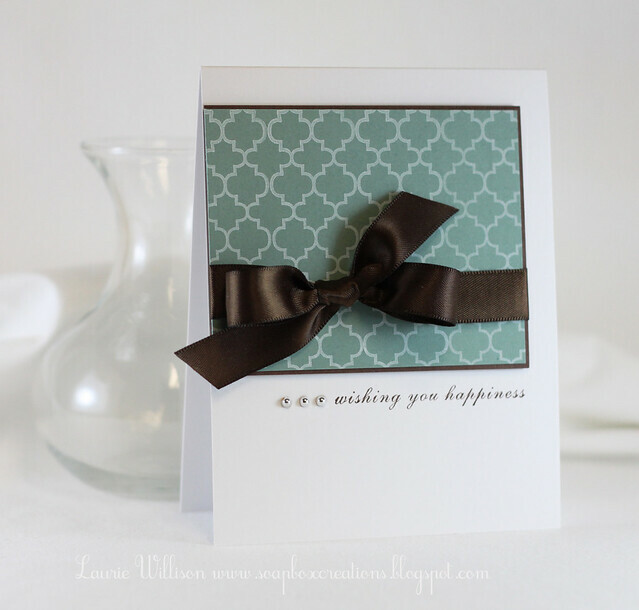 Love the color combo on this card-very soft and soothing. Love this! The colors look beautiful and I love the perfectly placed pearls. Stunning..yet simple. Love the colors and that bow is beautiful! This is so beautiful...classy and chic...simply lovely:)!! This is just oozing elegance, Laurie! Stunning! LOVE your colors and the simplicity of your design, Laurie! Your bows still look awesome! I'm not sure if I can tell... is that black or brown? gorgeous, stunning, beautiful!!! great card! Well, your bow is not out of practice! It's perfect! I miss your silver pearls.....please Michael's start carrying them again!! This is GORGEOUS!!! Love that sentiment - such a pretty font! Love the colors too - that brown bow is PERFECT! BEAUTIFUL! Love the pretty chocolate ribbon! Classy, elegant, gorgeous! I love it! I love your bows and love those silver pearls! Where are you finding them? I miss the one I was getting at Michaels! This is so gorgeous and one of my all time favorite color combos! Love the layout!